At a time when individuals have more power than at any time in history, inequality is widespread and deepening. The Funding Network’s Lisa Cotton says collaboration and collective giving are powerful practices with the potential to make lasting structural changes. A word you hear frequently in the nonprofit sector is ‘collaboration’, but what tends to happen in practice is usually more transactional than transformational, where partners don’t go beyond swapping logos and signing off on communications materials. 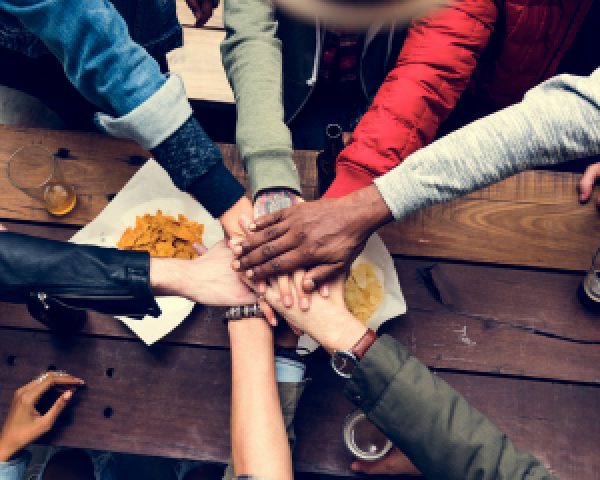 Collaboration that optimises the unique strengths of all parties has the potential to be transformational on both an organisational and individual level, and this is what’s happening in the collective giving space. In Australia, there are roughly 36 collective giving groups that are flipping the old assumption that you have to be wealthy to actively participate in philanthropy. Many are small giving circles, while other larger organisations operate nationally. What’s interesting about the emergence of larger models that are gaining momentum is we’re not thinking our way into a new way of giving, we’re acting our way into a new way of thinking about how we can more effectively leverage the resources of everyday Australians. We piloted The Funding Network (TFN) back in 2013. When we first talked about the idea of live crowdfunding, some people said we were crazy. They said that people were never going to stick their hands up in front of others to pledge funds. After the first few meetings we were beginning to think our vision to create a new way of giving was a little naïve, however, something in our guts told us, ‘No, let’s give it a go’, as philanthropy must continue to innovate. And I’m so happy we persisted. Four years on, TFN has generated over $5.4 million in support of over 140 grassroots non-profits that have positively impacted the lives of more than 50,000 people. We achieved this by collaborating with more than 45 corporations, foundations and government agencies, building visibility in the joy of supporting grassroots non-profits, and facilitating matched donations from a variety of sources, thereby engaging over 5,000 people in the process. But, is this the best we can do? Last year we asked ourselves this question and contemplated our next phase of growth (and impact). What would we replicate? What would we eliminate? How do we aspire to an exponential, not incremental, increase in collaboration, growth and impact? So we thought, why not white-label our methodology to tackle two of the biggest issues for non-profit organisations’ access to funding and access to new networks? And this problem is not surprising when you consider there are 60,000 deductible gift recipient non-profits in Australia with big brand names getting the lion’s share of funding. Take a moment to consider what innovative, smaller organisations could do if they could tap the right resources. So, what does ‘white-label’ mean? It’s a service or product purchased by an organisation that then re-brands it under its name, a bit like Coles’ home brand. They don’t manufacture the product, but they brand and market it under their name. TFN’s newly launched white-label service means non-profit organisations don’t need to reinvent the wheel to develop an efficient and effective way to raise funds and engage their donors. We want to put the power of live crowdfunding in their hands and give them the tools and advice to run their own events. Think of it as an engaging, unique and immersive way to run your next fundraising event. Work with people we respect and trust. For live-crowdfunding events to be successful, many elements must come together, but ultimately, it’s about how effectively people interact, both in a partnership sense and with the crowds. Share best practices, lessons, and templates with a broad a network. TFN’s success is predicated on collaboration. We openly share our model to increase the ability for non-profit organisations to secure resources from a growing movement of everyday givers. Let go of the need to retain complete control of brand or narrative. We experimented, sought constant feedback and iterated our model. We’ve invested resources in understanding what works and have developed an open-source methodology to spread the practice. So back to how these relationships work in practice. The non-profit’s primary responsibility is to have three projects to pitch, invite the audience and manage the event; receive funding, and provide an impact report to donors one year on. In addition to inducting the organisations in our methodology, we guide them through their first event, provide pitch coaching, undertake the MC and pledge facilitation role, and reconcile funds raised. The result so far? For each pilot event, each organisation has secured vastly more funding than it had anticipated, whilst deeply engaging donors and forging new funding relationships. When you compare this to the real cost of running big gala fundraising events, TFN’s white-label service is less demanding on staff and for a base cost of $10k, has the potential for a far greater return on investment. But our white-label service is not only about the money, it’s about creating bigger giving movements, that make us and our sector partners more effective and stronger and that move the needle on the mission we all share: creating a more empathetic society that pulls together to give everyone a fair go.